Student loan debt can cost you needlessly when you choose the wrong lender. And because you can never discharge a student loan, even in bankruptcy, it is especially important to pick the best interest rate. But interest rates alone won’t give you the full picture of what you need to know when you compare student lenders. You should also pay attention to fees that hit your account, the speed of funding, lending limits, and other factors like whether your lender will help you out in a pinch if you lose your job. In this Earnest vs SoFi student loan comparison, we examine the key factors so you know the best student loan provider for your unique needs. Do You Qualify For A SoFi or Earnest Loan? Earnest sets itself apart from other student lenders by evaluating not only your current but also your expected future financial situation. Got high earning potential? Earnest will factor that into its analysis where conventional lenders may examine only your current financial circumstances. If you aren’t saddled with a bunch of debt already, whether credit card bills or mortgage payments, you can probably pocket some healthy savings with Earnest. When you are approved for a loan from SoFi, you gain access to one of the most exclusive networks in the country. Getting a loan from SoFi is a different experience than what you may be used borrowing from a big bank. For one, you gain access to a highly active SoFi Facebook group, where members regularly correspond about financial matters. At SoFi, you will get invited to local in-person meetups where you can hear interesting speakers and network with like-minded community members. SoFi is constantly making access to its community more valuable. For example, SoFi will help you to find a new role if you happen to lose your job. In fact, SoFi is so popular that you will regularly see community members in San Francisco and other big cities walk around in free SoFi “swag” which new members receive. SoFi has a broad range of loan types. It supports clients throughout their financial lifecycle from the time they need student loans to the time they are ready to invest for retirement via its wealth management platform. Earnest provides comparatively fewer financial products, but stands toe-to-toe with SoFi in the areas in which it competes. The interest rate you pay will directly affect how much you can save so it’s perhaps the most important factor to consider when picking a lender. Earnest claims that student loan refinancing clients who consolidate and refi save $30,939 on average based on a $75,000 loan balance and using a weighted average of original loan terms. SoFi claims its clients save on average $290 per month ($3,480 per year) when refinancing student loans. 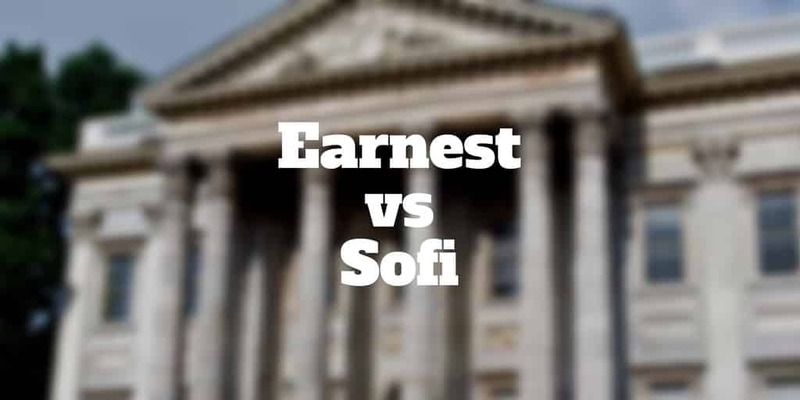 Based on our research, Earnest just squeezes out SoFi when comparing student loan refinancing rates but the difference is so small that it’s by no means a slam dunk victory. If you are paying Parent PLUS loans, you may be able to save money by choosing a private lender like SoFi or Earnest. You can consolidate Federal Parent PLUS and private qualified education loans without paying origination fees nor application fees. Earnest and SoFi charge similar rates for Parent PLUS refinancing as they do for student loan refinancing and Earnest enjoys the slight edge over SoFi in this category too. Personal loans from SoFi or Earnest may cost you less than other types of loans. The longer the term length you choose, the more you will pay over the life of the loan so, if you can afford a shorter timeline, it could save you a pretty penny. However, the shorter duration loans will cost you more each month out of pocket. Both SoFi and Earnest shine when it comes to the fees you will pay, or lack thereof. You won’t pay for any application fees, origination fees nor any prepayment penalty fees. However, SoFi will ding you with late fees if you pay more than 15 days late. Expect to pay $5 or 4% of the total payment due, whichever is less. Earnest, on the other hand, won’t hit you with any late payment fees. Both lenders entice you to choose an Autopay option by discounting your rate by 0.125% when you select it. You will also earn a cash bonus for any referrals that you send to each company. Both companies offer up to six month of deferment when eligibility criteria are met. And both rollover grace periods when refinancing. However, SoFi earns the victory when it comes to perks. When you lose a job, SoFi helps you to find a new position. And it regularly hosts community meetups so you can network with community members. You will find its Facebook group to be among the most active and supportive of any financial company. Not only do moderators weigh in to address concerns but members will regularly chime in to answer questions too. SoFi members also receive SoFi swag, like t-shirts and mugs, in the mail when signing up. Note: Earnest does not issue loans in Alabama, Delaware, Kentucky, Nevada, or Rhode Island. Keep in mind that student loan refinancing cannot be used for new schooling loans and existing debt must be from loans for a Title IV-accredited school. To qualify for an Earnest personal loan, your credit score will need to be at least 680. When you apply for an Earnest loan, the following factors affect your likelihood of receiving approval. The minimum loan amount required to qualify for student loan refinancing or Parent PLUS refinancing with SoFi is $5,000. If you live in one of the states where Earnest does not lend, SoFi is a good alternative because it is permitted to refinance loans in all 50 states and the District of Columbia. If you are looking for a personal loan over the $75,000 limit available at Earnest, SoFi is a good alternative too because it provides personal loans up to $100,000. Earnest and SoFi are among the new crop of private lenders who provide fast, easy application processes. In as fast as 10 days you can receive funding from both companies, but you will need to make sure your documents are in order to qualify for funding timelines that fast. SoFi may even be able to deliver funds in as soon as 7 days if everything is in order. Both SoFi and Earnest impose a $5,000 minimum loan amount to qualify for student loan refinancing and Parent PLUS refinancing. The SoFi maximum loan amount is $100,000 for personal loans and the Earnest maximum loan amount is $75,000 for personal loans. ✅ Low Rates: Both Earnest and SoFi have competitive rates for qualified borrowers but Earnest just edges out SoFi with lower variable rates. ✅ Loan Amounts: SoFi personal loan amounts up to $100,000 are available compared to $75,000 offered by Earnest. ✅ Fees: Neither SoFi nor Earnest charge late fees, application fees nor origination fees but SoFi will ding you with late fees whereas Earnest charges no late penalty fees. ✅ Funding Timeline: Applying for loans with both lenders is fast and easy but SoFi enjoys a slight edge by providing funds in as fast as 7 days compared to 10 days at Earnest. ✅ ACH Interest Rate Deduction: Both SoFi and Earnest reward borrowers who choose the AutoPay feature with a 0.125% interest rate deduction. ✅ CoSigner Support: SoFi permits co-signers whereas Earnest does not. ✅ Community: SoFi claims that 98% of its community members recommend it and across the board it earns top marks for its lively and supportive Facebook community. Not much separates SoFi and Earnest. Although Earnest enjoys a slight edge when it comes to low interest rates, it’s so small as to be a virtual dead heat between the two lenders. When it comes to funding timeline, both issue loan funds within 10 days, though SoFi may issue loans in as fast as 7 days. Where Earnest does shine compared to SoFi is its lack of late fees – SoFi charges $5 or 4% of the payment due, whichever is smaller. For borrowers who need co-signer support, SoFi is the better choice. It’s also a better option for anyone looking for a financial company who can partner with them throughout their financial lifecycle from student loan refinancing to personal loans in order to consolidate credit card debt all the way through to wealth management services after building up a nest-egg. SoFi also provides higher personal loan amounts compared to Earnest and has perhaps the most vibrant and supportive online community of any financial lender.